With the weather warming up, and all of the creepy crawlies waking up, we want to remind you about the importance of parasite prevention. Regular flea & tick treatments are an easy way to keep you four legged friend healthy and happy. Not to mention, keeping your home and you parasite free. How does my pet get fleas/ticks? Other Animals - Even if your pet is not around any other animals, but those within your home, this is a possibility. Wild animals, out door or feral cats and any other animal that may wander through your yard can carry and therefore spread fleas & ticks. Human Transportation - You and your human guests can also carry fleas & ticks into your home. Not only can you carry them from one animal you interact with to the next, you can also get hitch hikers from simply being in the great outdoors. Outside the Home - Anytime your pet is outside the "safety" of your home, the chances of getting fleas & ticks increases. So, while you may be on alert after taking your pet to the lake or on a hike through the woods or a field, remember there is always an opportunity for your pet to pick up fleas & ticks. What are the most common ticks in the Cincinnati area? What is the life-cycle of a tick? What is the biggest concern if my pet does have a tick(s)? Generally speaking, the number one conrcern in regards to ticks is Lyme Disease. 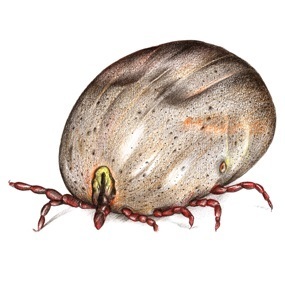 Luckily, the only tick to carry Lyme disease in our are is the Blacklegged/Deer Tick. The CDC lists a number of other diseases that can be transmitted via ticks. Very small, young or old pets may also be at risk for anemia. How do I prevent, treat, and detect for ticks? Outdoors: Keep lawn and weeds under control to create a less habitable environment for flea larvae and adults. Discourage nesting or roosting birds and other mammals on or near the premises. Thoroughly combing through your pet's fur is the easiest way to look for ticks. They like to hide in crevices, so make sure to look in between toes, in ears and under "arm pits". It’s important to note how long the tick fed before you discovered it. If it is relatively flat, that means the tick attached recently and hasn’t been feeding long. If it’s engorged or burrowed into the skin, the tick may have fed for an extended time. Research conducted by Ohio State University has found that transmission of disease, such as Lyme, begins at approximately 24 hours. There is greater risk for infection the longer feeding occurs. What is the most common flea species? What is the life-cycle of a flea? What is the biggest concern if my dog or cat has fleas? Flea bite dermatitis, which is a specific allergy to flea saliva. Tapeworms - these are parasites that are passed to your pet when they actually ingest the flea. How do I prevent, detect, and treat for fleas? Outdoors: Keep lawn and weeds under control to create a less habitable environment for flea larvae and adults. Discourage nesting or roosting birds and other mammals on or near the premises. Screen or seal vents, chimneys, crevices, etc., whererodents may enter crawlspaces and buildings. Elsa is a beautiful 6 year old golden retriever. She enjoys running around with her pals in day camp every week and barking whenever possible!